I wasn’t really watching the counter rise, more a case of just letting it do its own thing and after a busy week it was over 500. I decided that I should do something to celebrate this milestone ( that Facebook thoughtfully pointed out to me). What better way to celebrate than some give-aways! 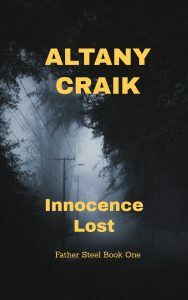 ‘Innocence Lost’ will be FREE starting Sunday evening at 2030 (15/04/18) for a limited time only. 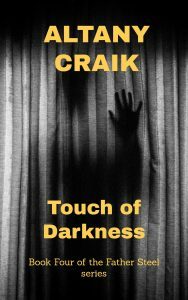 ‘In the Shadow of St Giles’, ‘Eye of the Crow’ and ‘Touch of Darkness’ will be 99p (or 99c – depending on where you are) for a whole week starting 0900 Monday Morning in the UK (0900 PDT Monday for the USA). Book 4, due before Santa. I hope to have book four completed just before Christmas. Father Steel makes another foray onto the mean streets of Edinburgh. A little snippet to start us off! November, thought by many to be the autumn, is the cusp of the long Scottish winter looming ahead and the beginning of the grey, grinding misery that makes many Scots emigrate. Of course those of us who stubbornly remain have built up a resistance to the weather. It manifests itself as a miserable look on every face as I walk up Princes Street, once the premier shopping place outside of London but now, not so much. The dull sky and the constant threat of rain has my coat closed tight, collar up and hands shoved deep in my pockets. I wander aimlessly just soaking in my first Saturday morning in the Capital since my enforced incarceration on retreat. I am refreshed, apparently, after two weeks of post-convalescence retreat with the friars. A large country house given over to an order of wealth-abhorring secluded clergymen is not my idea of a good time but the stillness has definitely recharged my spiritual batteries. The beard on my chin is part of my new look to stop me being recognised by the press after my rather public showing in Perth not too long ago. It is very much salt and pepper as the grey from my head is replicated on my chin. Distinguished I would like to call it. So far I haven’t needed the fake nose and glasses to complete the new me but they are always an option. The Bishop has given me the remainder of the year off from my special duties and I am glad of the rest. I know that my body has taken a beating this year and I need to take more care of myself. I might even join a gym or take up running. Not very likely but you never know, after all, I am a new man. Moving along the street in Edinburgh is about rhythm. You need to feel the wave as it slides along the street, and get your pace just right to not end up apologising for bumping into everyone or having to veer away from impending collisions. I am getting into my stride, slower and shorter than usual, and focusing on not much at all except a growing desire for a coffee and a cake. I let my eyes slide over the sea of people, all miserable looking, and just soak in the sights and sounds. I still haven’t decided on the title but it will be named soon! Posted on November 21, 2017 Leave a comment on Book 4, due before Santa. I have finally gotten around to making a facebook page. I know, it isn’t difficult and yet I have been putting it off for longer than I care to think about. After all I use facebook groups extensively to promote my books and it seemed a little silly to not set up a page. Dark nights mean more writing!!! I love this time of year. No, really, I do. With the days getting shorter and the weather becoming increasingly inclement it means being inside more. Being inside means more time to write. It also means, that Nanowrimo is nearly here and a concerted effort to write 50000 words in November. I enjoy the taking part and the camaraderie but I think that sometimes the words that flow out of my fingertips are a bit rough and ready. Although the excitement of getting the first draft of the story on the page is great and brings a happy feeling of achievement. A hat trick of Nano successes over the last three years means that I am hoping for four in a row this year. 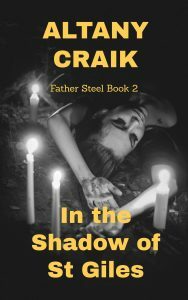 I am also going to spend a bit of time in the next few months developing a newsletter that will give readers of the Father Steel series some insights and snippets that I hope you will enjoy. I will also keep you posted on other writing projects too! Posted on October 22, 2017 Leave a comment on Dark nights mean more writing!!! Having decided to change web host some six months ago and discovering my backup of material was irretrievable a new page has been needed and yet, strangely, a long time coming. There is much to share. Since the loss of the previous page I have released the second in the Andrew Steel series of Occult thrillers and am now progressing the third in the series. After a bit of formatting excitement both books are available in paperback and in ebook format from Amazon. Links at the end. 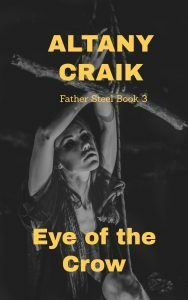 I look forward to book three being finished and available by the end of the summer ‘The Eye of the Crow’ is coming along nicely.